Discover the beauty and charm of three of Italy's iconic cities - Rome, Florence and Venice. 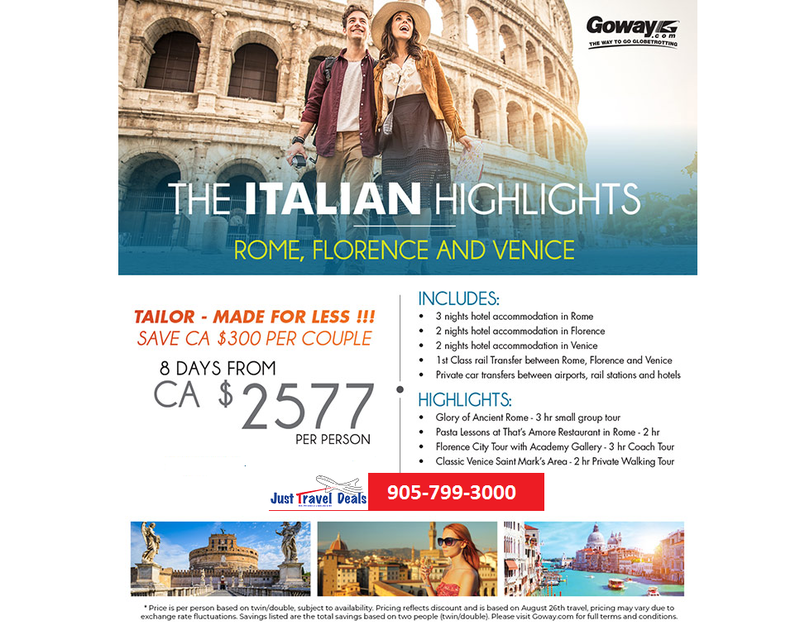 Visit historic Rome with it's ancient ruins and Vatican City, enjoy wine tasting and the magnificent art and architecture of Florence. As a grand finale, spend time in Venice, city of canals. Arrive in Rome and transfer to your hotel for a 3 night stay. The following morning, enjoy a tour of the city which includes a visit to the ancient sites of the Colosseum, once the home of Roman era entertainment and the Forum, the political centre of Imperial Rome. Also pass by the exceptionally visual monument dedicated to King Emmanuelle II. The next day brings an interesting visit to learn about the skills and secrets of Italian cooking. You will prepare your own meal and, of course, eat it too. Plus you will enjoy sampling wines from the Lazio region. Depart from Rome by train to Florence where you will spend the next two nights. The following morning, you will discover the highlights of this beautiful city on a tour which takes in the Piazza Michelangelo, the Accademia famous for the statue of David by Michelangelo and a stroll through the streets to reach the renowned Duomo (Cathedral). From Florence, take the train to Venice for a further 2 night stay. During your time here, you will have a walking tour of Venice to see St. Mark’s Square with St. Mark’s Cathedral, the Doges Palace, the Bridge of Sighs and Marco Polo’s House. Also visit the Campo Santa Maria Formosa Church and the Rialto Bridge which overlooks the Grand Canal. Florence is the capital city of the Italian region of Tuscany and of the province of Florence. It is the most populous city in Tuscany, with 367,569 inhabitants (1,500,000 in the metropolitan area). The city lies on the River Arno and is known for its history and its importance in the Middle Ages and in the Renaissance, especially for its art and architecture. A centre of medieval European trade and finance and one of the wealthiest cities of the time, Florence is considered the birthplace of the Renaissance; it has been called the Athens of the Middle Ages. Florence is often known as the ''Jewel of the Renaissance''. Scottish Unique Experience - "Meet the Neighbours, You Might be Related"
The International Buzz: FREE night in Europe! Costa Cruises Explore Europe like the Europeans do! Spain, Italy, France!